Performance results were recently released for the 5th year of the Medicare Shared Savings Program (MSSP). These results show that a small but growing proportion of ACOs continue to earn shared savings from Medicare, as shown below. This data comes at a pivotal moment for Accountable Care Organizations (ACOs) as they rush to determine how to respond to the CMS’s proposed rule known as Pathways to Success introduced on August 9th. These results from the 2017 performance year may give many Track 1 ACOs the green, yellow, or red light to jump into a new risk-bearing option. Currently, Track 1 ACOs are eligible to share in up to 50% of any savings earned without bearing financial responsibility for poor performance. 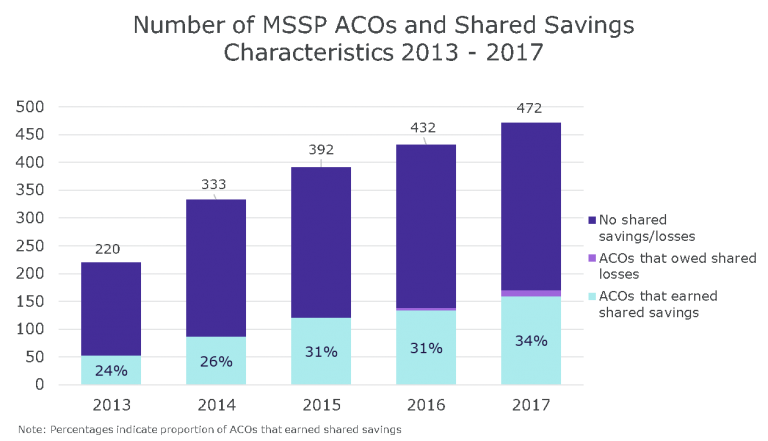 Almost one third, or 139 of 433, Track 1 MSSP ACOs took home savings in 2017. Those who earned a bonus payment beat their benchmark by, on average, $720 per beneficiary. Comparably, 29% of Track 1 ACOs earned shared savings and achieved average savings of $810 per beneficiary in 2016. As shown in the table below, in the proposed rule the CMS intends to limit the percent of savings an ACO can share in until it accepts some responsibility for spending significantly above benchmark (i.e. shared losses). Under the proposed terms, a new ACO can enter at BASIC Level A or higher, while renewing Track 1 ACOs can enter at BASIC Level B or higher. Both of these entry Levels have a maximum sharing rate of 25% compared to the current 50%. Consider the 139 Track 1 MSSP ACOs that shared in savings in 2017. On average, these ACOs received a bonus payment of $319 per beneficiary, which equates to a sharing rate of about 45%. To maintain the same sharing rate, they will need to enter Level E in the BASIC track – and bear responsibility for up to 30% of shared losses. Those who wish to continue in an upside-only model and enter BASIC Level B will only be able to take about half of these savings home as the maximum sharing rate would decrease from 50% to 25% under the proposed rule. This equates to less than $160 per beneficiary. ACOs that are hesitant to take on immediate risk may begin to question whether these reduced payouts are worth the population health investment costs. Under the proposed Pathways to Success, CMS is forcing (and encouraging through lower sharing rates in upside only arrangements) the shift to models that include sharing losses at a quicker pace. Currently, ACOs may remain in one track for a three-year agreement period with consistent risk and reward levels each performance year. Under Pathways to Success, ACOs will enter a five-year agreement. Those in the BASIC track will progress along the continuum of Levels each performance year. ACOs in the ENHANCED track assume the maximum level of risk/reward for all five years. This progression to risk assumes that, with experience, ACOs should be more equipped to take on downside risk. The table below shows that there is an apparent correlation between experience and probability of achieving shared savings. 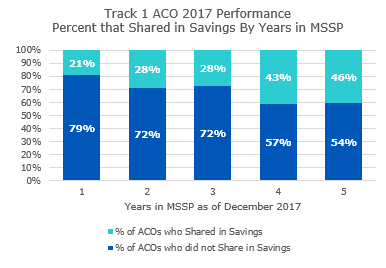 While only 21% of Track 1 ACOs that joined the MSSP in 2017 earned savings, almost half of those who have participated for at least five performance years (46%) were able to lower costs enough to earn shared savings The Proposed Pathways to Success rule expects all renewing or re-entering ACOs to be ready and willing to take on risk by their second full performance year, and new entrants to be ready by their third (i.e. BASIC Level C or higher). Assuming a similar pattern as shown above, only 28% of upside-only ACOs will be well-positioned to take on risk and succeed under the new model in their 2nd or 3rd year of performance. Given these changes in shared savings potential and track options, the Proposed Pathways to Success will create winners and losers in a different manner than the current model. To decide how to proceed, every ACO must conduct a deep dive into historical performance, complete a detailed financial model based on their particular characteristics, and revisit their organization’s overall value-based payment strategy. For more information, refer to The Centers for Medicare & Medicaid Services Fact Sheet: “Proposed Pathways to Success for the Medicare Shared Savings Program”. August 2018. Two years for new ACOs and one performance year for returning Track 1 ACOs (regardless of how many years they have participated in MSSP).